Theodore I Palaiologos was despot (despotēs) in the Morea from 1383 until his death on 24 June 1407. He was the youngest surviving son of the Byzantine Emperor John V Palaiologos and his wife Helena Kantakouzene. His maternal grandfather was former Emperor John VI Kantakouzenos. His older brothers were Emperor Andronikos IV Palaiologos and Manuel II Palaiologos. The Frankokratia, also known as Latinokratia and, for the Venetian domains, Venetokratia or Enetokratia, was the period in Greek history after the Fourth Crusade (1204), when a number of primarily French and Italian Crusader states were established on the territory of the dissolved Byzantine Empire. The Theme of Thessalonica was a military-civilian province of the Byzantine Empire located in the southern Balkans, comprising varying parts of Central and Western Macedonia and centred on Thessalonica, the Empire's second-most important city. The Theme of Hellas was a Byzantine military-civilian province located in southern Greece. 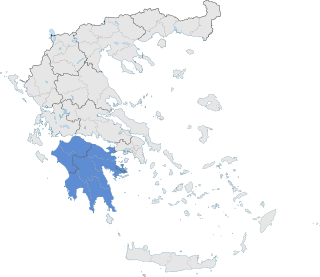 The theme encompassed parts of Central Greece, Thessaly and, until c. 800, the Peloponnese peninsula. It was established in the late 7th century, and survived until the late 11th/12th century, when it was broken up into smaller districts. 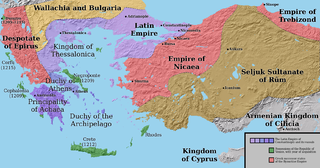 Empire of Thessalonica is a historiographic term used by some modern scholars to refer to the short-lived Byzantine Greek state centred on the city of Thessalonica between 1224 and 1246 and ruled by the Komnenodoukas dynasty of Epirus. At the time of its establishment, the Empire of Thessalonica, under the capable Theodore Komnenos Doukas, rivaled the Empire of Nicaea and the Second Bulgarian Empire as the strongest state in the region, and aspired to capturing Constantinople, putting an end to the Latin Empire, and restoring the Byzantine Empire that had been extinguished in 1204.